Ray trace rendering is playing an increasingly important role in all areas of design, from product development and manufacturing to architecture, engineering and construction. If used frequently, by the designer, rather than just for client presentations or marketing, it can have a huge influence on the design process. The problem is, workstations that can deliver results very quickly in CPU-based ray trace renderers, like Luxion KeyShot, V-Ray (CPU) and those built into workhorse CAD tools, have been prohibitively expensive. 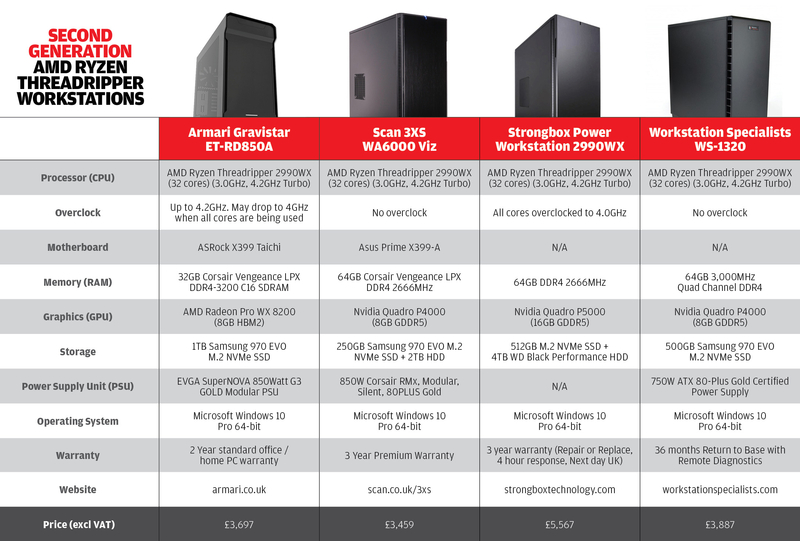 Arming a team of product designers or architects with £10k dual Xeon workstations is simply not realistic when firms are used to paying under £2K for a quad-core CAD machine. But the workstation landscape is now changing very quickly. Last year, AMD shook things up dramatically with the launch of Ryzen Threadripper, a new generation desktop CPU with up to 16 cores and 32 threads. It easily beat Intel’s 10-core Core i9-7900X in a rendering race but only cost $999. After years of being given a free rein in the performance PC market, Intel suddenly had some serious competition. But AMD has not stopped there. One year later, it has launched a second generation Ryzen Threadripper, based on the 12nm Zen+ architecture that allows for higher frequency and better performance per watt. The flagship Threadripper 2990WX is a 32-core, 250W beast, which has 14 more cores than Intel’s current top-end enthusiast processor, the Core i9-7980XE Extreme Edition, for virtually the same price. When AMD launched 1st Gen Threadripper, there was a big focus on so-called enthusiasts — gamers, for instance, who might want to stream gaming sessions live or encode video at the same time. For 2nd Gen Threadripper, AMD is trying to appeal more to designers and creatives that use professional workstations. To do this, 2nd Gen Threadripper is split into two families: the X Series for ‘enthusiasts and gamers’; and the WX Series for ‘creators and innovators’ — in short, those who use rendering applications that are able to take full advantage of a processor with lots of cores. 2nd Gen Threadripper X Series is really just an improvement over the 1st Gen, offering the same number of cores, but faster. It includes the 2920X (12 cores, 24 threads, $649) and the 2950X (16 cores, 32 threads, $899). 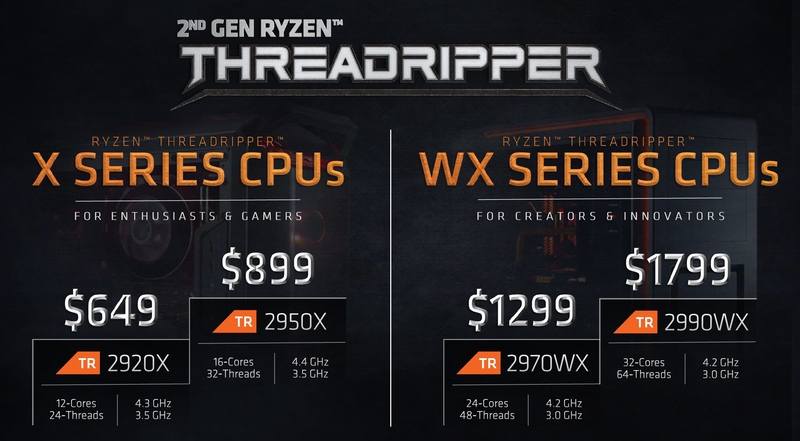 However, it’s the Threadripper WX Series that goes into new territory, with significantly more cores from the 2970WX (24 cores, 48 threads, $1,299) and 2990WX (32 cores, 64 threads, $1,799). As one would expect, X Series frequencies are higher than those in the WX Series as they have fewer cores, but, amazingly, the difference is not as big as one might expect, as you can see in figure below. The flagship 32-core Threadripper 2990WX deserves a particular mention, as it has a base frequency of 3.0GHz and a top turbo frequency of 4.2GHz. In contrast, AMD Epyc, Threadripper’s server-grade cousin launched last year, runs at much lower frequencies. The Epyc 7551 we reviewed in January, for example, starts at 2.0GHz and only goes up to 3.0GHz turbo. One of the reasons Threadripper WX is able to combine lots of cores with such high frequencies is the higher TDP (Thermal Design Power). Threadripper WX is rated at 250W, while Threadripper X is 180W. This is significantly more than your average workstation CPU and even higher than a top-end server CPU like the 18-core Intel Xeon Gold 6154, which is rated at 200W. AMD might have workstation aspirations for 2nd Gen Threadripper, but with its 3D gaming heritage, much is made of its overclocking capabilities. At the launch event in Italy last month, AMD’s overclocking team went all out with liquid nitrogen cooling, pushing the Threadripper 2990WX to over 5.1GHz on all cores and achieving a record-breaking score of 7,618 in the multithreaded rendering benchmark Cinebench. This absolutely trounced the previous best of 5,828 held by the 18-core Intel Core i9-7980XE. Of course, this level of overclocking is crazy, as machines are only able to remain stable for the matter of seconds needed to complete the short benchmark. For professional use, stability and endurance are everything, particularly as most manufacturers back up their workstations with a 3-year warranty. Of the UK workstation manufacturers we contacted, only Strongbox and Armari are getting involved in overclocking and nowhere near 5.1GHz. The others are relying on a couple of features built into the Threadripper architecture that help boost performance. These are Precision Boost 2, which allows turbo to be exploited across more threads, and Extended Frequency Range (XFR) 2 which can give a significant boost in frequency across all cores if the cooling inside the workstation allows for it. Overclocking is traditionally done in the BIOS by enthusiasts, but AMD is looking to make it easier for less experienced users to get more out of the processor. Overclocking can now be done through the bundled Ryzen Master software using Precision Boost Overdrive (PBO), a new feature designed to offer overclocking at the push of a button. It essentially allows Precision Boost to act more aggressively. To put some numbers behind it, AMD reckons you can get up to 13% more performance with a Threadripper 2990X running the multithreaded Cinebench benchmark. This all sounds great but, as with any form of overclocking, there are risks, so using PBO invalidates AMD’s warranty. If you do decide to go down this route, you will certainly need to have an efficient cooling system and a high wattage power supply, as overclocking means the CPU draws much more power than it does at standard clock speeds. With all 32 cores running at 4.0GHz, for example, power draw on a Threadripper 2990X will likely be well over 500W. From a professional workstation perspective, we feel overclocking should be left to the specialist workstation manufacturers who know exactly how far to push a machine and keep it stable over an extended period of time. Nobody wants to arrive at the office in the morning to find a time-critical render job has crashed overnight or, worse still, a burnt-out motherboard. However, in saying that, if you do know what you’re doing and have confidence in your thermal management, then overclocking 2nd Gen Threadripper is certainly an option. AMD provided a white box workstation for us to test, built around the flagship Threadripper 2990X processor with 32 cores. The full specs can be seen below. OS: Windows Pro 10 64-bit. All tests were run at the 2990WX’s standard clock speed — a base frequency of 3.0GHz and a top turbo frequency of 4.2GHz. Our first port of call was Luxion KeyShot, one of the most popular design-viz focused CPU rendering applications. The machine ripped through our standard motorbike test model, rendering the 4K scene with 128 passes in a phenomenal 116 seconds. This is only 22 seconds slower than a pair of Intel Xeon Gold 6154 (18 cores, 3.0GHz - 3.70GHz), which are listed at $3,543 apiece and 25 seconds faster than the 18-core Intel Core i9 7980XE ($1,699) with all cores overclocked to 4.2GHz, significantly above its 2.6GHz base frequency. 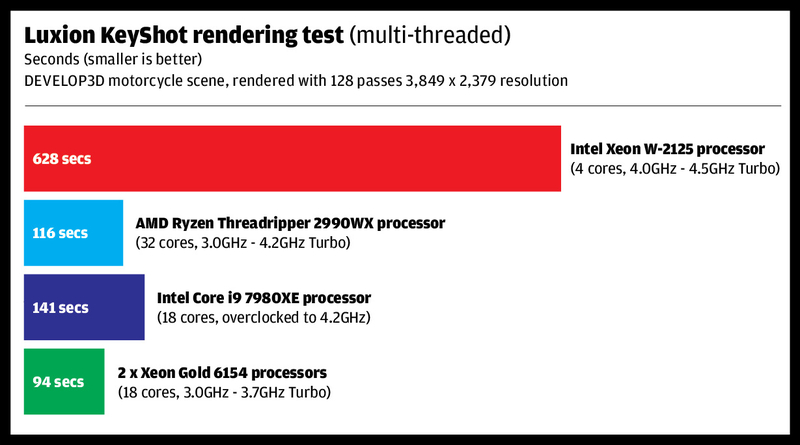 To put this in perspective, a typical CAD workstation with a quad core Intel Xeon W-2125 (4.0GHz - 4.5GHz) took 628 seconds to complete the test. That’s time for a cup of tea and a quick trip to the bathroom. To give an idea of what a machine like this could do for design viz workflows in KeyShot, we tried a number of different render jobs with a variety of settings. A good quality FHD render with 64 passes finished in 16.8 seconds, taking 33 seconds for 128 passes. It’s not instant, but it does mean very fast feedback. At the other end of the spectrum, a 7,680 x 4,758 resolution scene with 256 passes took just over 15 minutes. To explore how CPU frequency changes over time, we set a colossal scene to render and kept one eye on the popular CPU monitoring software, CPU-Z. Frequency started at 3.30GHz, but dropped every few minutes, settling on 2.90GHz after 15 minutes, where it stayed at until the render finished an hour later. Very little noise came from the liquid cooler’s fans. With the CPU suitably warmed up, we re-ran our original KeyShot benchmark and got a time of 126 seconds. It’s not a massive difference to the ‘from cold’ time of 116 seconds, but it’s important to note. Our next stop was V-Ray, an application more popular in architectural design viz. We ran the public V-Ray benchmark and it took a mere 27 seconds to complete. In comparison, a pair of Intel Xeon Gold 6154 (18 cores, 3.0GHz - 3.70GHz) completed the test in 21 seconds, and an Intel Xeon W-2125 (4 cores, 4.0GHz - 4.5GHz) took 133 seconds. On the V-Ray benchmark website, the top Threadripper 2990WX score is 23.5 seconds. In that particular test machine, the CPU was overclocked to 3.75GHz. 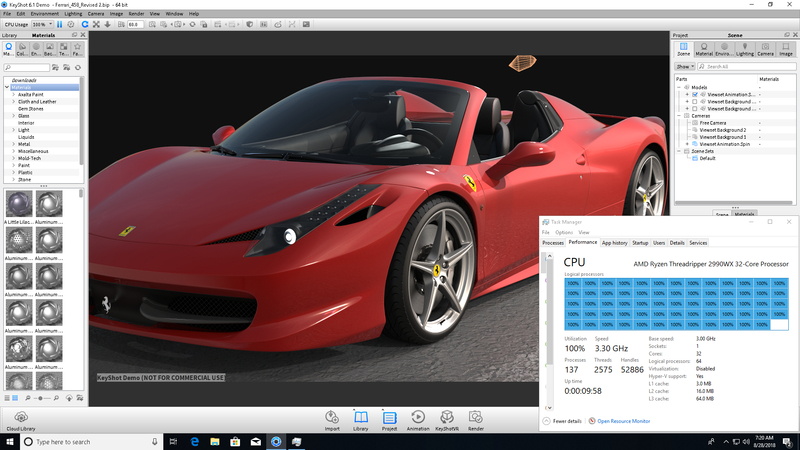 Rendering is one thing, as ray tracing devours all the CPU cores you throw at it, but CAD software is usually much less friendly with multi-core workstations. Many CAD software processes are single- threaded, so rely on a single CPU core, making GHz of utmost importance. We tested the Threadripper 2990WX in SolidWorks in a number of different single-threaded workflows and the system was able to maintain a frequency of 4.2GHz, as per its stated turbo. 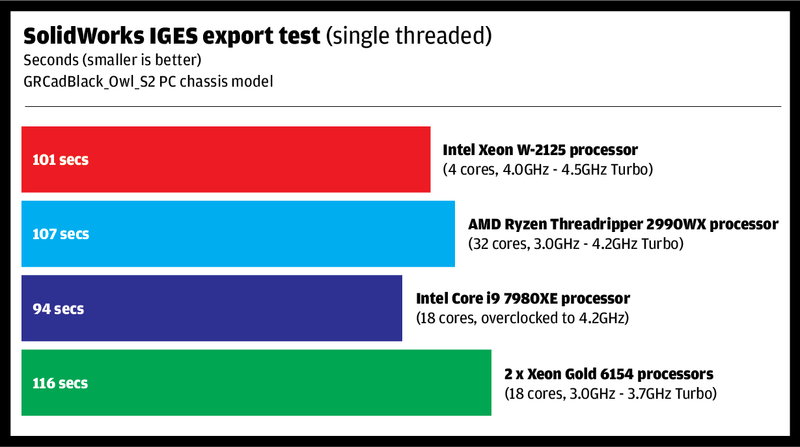 It completed our IGES export test in 107 seconds, which is not that far behind the 101 seconds it took an Intel Xeon W-2125 (4 Cores, 4.0GHz -4.5GHz) based workstation and is actually faster than the dual Xeon Gold 6154 (116 seconds). With Threadripper, all eyes are obviously on CPU workloads, but the impact on graphics performance is also very important for 3D design. Our test machine’s AMD Radeon Pro WX 9100 is a powerful professional GPU for high-end 3D and VR. 3D performance was pretty much as we expected, with benchmark scores very close to that of an Intel Xeon Gold 6154 (18 cores, 3.0GHz – 3.7GHz Turbo). In game engine and high-end viz applications, such as such as Autodesk VRED Professional, the speed of the CPU has much less influence on 3D graphics performance, as the GPU is usually the bottleneck. However, in CAD, where CPU frequency has a big influence on 3D performance, you will likely experience a small drop in frame rates if you went head to head with a high GHz quad-core CPU, such as the Intel Xeon W-2125 (4 cores, 4.0GHz - 4.5GHz). In practical terms, however, this difference would probably go unnoticed and in all our hands-on testing in SolidWorks, we found 3D performance to be perfectly acceptable. Even large models could be smoothly manipulated in the CAD viewport. AMD looks to have delivered an incredible proposition for design viz, rewriting the rulebook when it comes to rendering on a single desktop CPU. 2nd Gen Threadripper has the potential to completely transform the way design firms use ray trace rendering, delivering high-quality ‘photoreal’ images in seconds rather than minutes. Most impressively, AMD has managed to do this without really compromising performance in single-threaded CAD applications. You really can have your cake and eat it too. And then there’s the price. At $1,799, the 32-core Threadripper 2990X can certainly be considered affordable if you take design viz seriously. But it’s perhaps the other 2nd Gen Threadripper models that will more likely find their way onto the desktops of designers, engineers and architects. In the UK, we expect entry-level 16-core Threadripper 2950X workstations will be available for just over £2,000 Ex VAT, which is not that much more than a typical mainstream CAD workstation with four or six cores. Of course, for AMD Threadripper to become a truly serious contender in the workstation market it will need to be adopted by global OEMs like Dell and HP and not just the specialist workstation manufacturers. At the moment we’ve had no indication if or when this might happen but, at the very least, we can expect Threadripper to keep Intel Core i9 workstations, which are now offered by HP, Dell and Fujitsu, very competitive on price. And no designer with an interest in viz is going to complain about that. The majority of AMD Ryzen Threadripper workstations are desktop towers. However, specialist UK manufacturer Strongbox has developed the HIVE, a 1U rack workstation that sits in a datacenter and can be accessed from anywhere, either over LAN or a high-bandwidth, low-latency Internet connection. There are a few reasons why the Strongbox HIVE stands out from other 1U rack workstations. First, the slimline chassis actually contains two discrete workstations, each with its own memory (up to 64GB), graphics card, storage and power supply. Each designer uses a thin or zero client to access an individual machine over a one-to-one connection using Teradici’s PCoIP Workstation Access Software. This means dedicated hardware for guaranteed performance and firms do not have to get into the complexities of virtualisation. The second standout feature is that each discrete workstation delivers up to 32 cores through the Threadripper 2990WX. There’s nothing that we know of that can offer the same level of rendering performance in a 1U chassis. The most exciting aspect of the Strongbox HIVE is that it gives users an incredible amount of processing power right at their fingertips, but with all the benefits of a remote workstation datacentre solution, such as easier data management, elimination of office noise, IP protection and simplified IT management. The one downside of the HIVE is that it can only take two single-height graphics cards (one for each discrete workstation), so the choice is limited to the Nvidia Quadro P4000, the AMD Radeon Pro WX 7100 or below. These graphics cards are fine for 3D CAD and mainstream design visualisation, but those who need more 3D power from a double-height card miss out. The Strongbox HIVE can also be used as a render node.